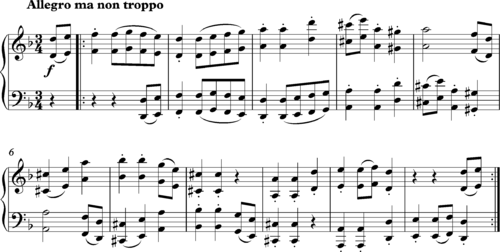 In music, a canon is a contrapuntal (counterpoint-based) compositional technique or texture that employs a melody with one or more imitations of the melody played after a given duration (e.g., quarter rest, one measure, etc.). The initial melody is called the leader (or dux), while the imitative melody, which is played in a different voice, is called the follower (or comes). The follower must imitate the leader, either as an exact replication of its rhythms and intervals or some transformation thereof (see "Types of canon", below). 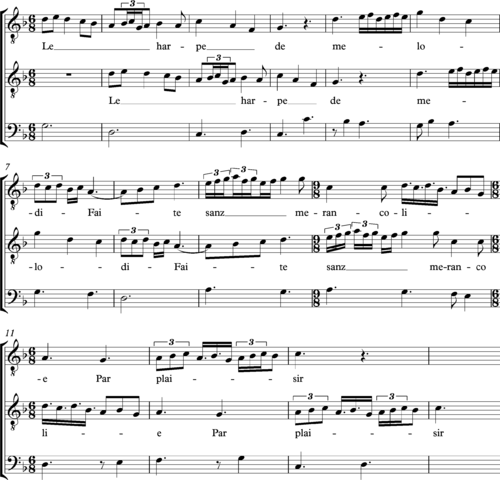 Repeating canons in which all voices are musically identical are called rounds—"Row, Row, Row Your Boat" and "Frère Jacques" being widely known examples. During the Middle Ages, Renaissance, and Baroque—that is, through the early 18th century—any kind of imitative musical counterpoints were called fugues, with the strict imitation now known as canon qualified as fuga ligata, meaning "fettered fugue" (Bridge , 76; Mann, Wilson, and Urquhart n.d.; Walker 2000, 1). Only in the 16th century did the word "canon" begin to be used to describe the strict, imitative texture created by such a procedure (Mann, Wilson, and Urquhart n.d.). The word is derived from the Greek "κανών", Latinised as canon, which means "law" or "norm", and may be related to 8th century Byzantine hymns, or canons, like the Great Canon by St. Andrew of Crete. In contrapuntal usage, the word refers to the "rule" explaining the number of parts, places of entry, transposition, and so on, according to which one or more additional parts may be derived from a single written melodic line. This rule was usually given verbally, but could also be supplemented by special signs in the score, sometimes themselves called canoni (Bridge , 76). The earliest known non-religious canons are English rounds, a form called rondellus starting in the 14th century Mann, Wilson, and Urquhart n.d.; the best known is Sumer Is Icumen In (composed around 1250), called a rota ("wheel") in the manuscript source (Sanders 2001a; Sanders 2001b). 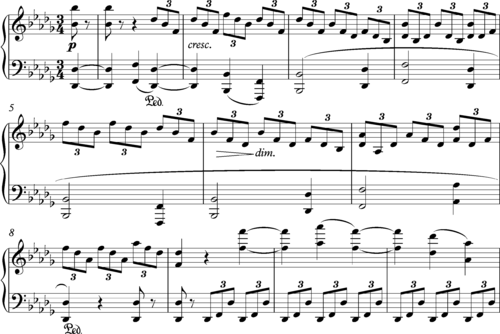 Michael Musgrave (1985, 262) writes that this piece is "of and anxious, suppressed nature, a quality arising from its strict use of canon at the octave… in the central section this tension is temporarily eased through a very contained passage which employs the canon in chordal terms between the hands." Considering the many types of canon "in the tonal repertoire", it may be ironic that "canon – the strictest type of imitation – has such a wide variety of possibilities" (Davidian 2015, 136). The most rigid and ingenious forms of canon are not strictly concerned with pattern but also with content. Canons are classified by various traits: the number of voices, the interval at which each successive voice is transposed in relation to the preceding voice, whether voices are inverse, retrograde, or retrograde-inverse; the temporal distance between each voice, whether the intervals of the second voice are exactly those of the original or if they are adjusted to fit the diatonic scale, and the tempo of successive voices. However, canons may use more than one of the above methods. Although, for clarity, this article uses leader and follower(s) to denote the leading voice in a canon and those that imitate it, musicological literature also uses the traditional Latin terms dux and comes for "leader" and "follower", respectively. A canon of two voices may be called a canon in two, similarly a canon of x voices would be called a canon in x. This terminology may be used in combination with a similar terminology for the interval between each voice, different from the terminology in the following paragraph. Another standard designation is "Canon: Two in One", which means two voices in one canon. "Canon: Four in Two" means four voices with two simultaneous canons. While "Canon: Six in Three" means six voices with three simultaneous canons, and so on. A simple canon (also known as a round) imitates the leader perfectly at the octave or unison. Well-known canons of this type include the famous children's songs Row, Row, Row Your Boat and Frère Jacques. If the follower imitates the precise interval quality of the leader, then it is called a strict canon; if the follower imitates the interval number (but not the quality—e.g., a major third may become a minor third), it is called a free canon (Kennedy 1994). The follower is by definition a contrapuntal derivation of the leader. An inversion canon (also called an al rovescio canon) has the follower moving in contrary motion to the leader. Where the leader would go down by a particular interval, the follower goes up by that same interval (Kennedy 1994). In a retrograde canon, also known as a canon cancrizans (Latin for crab canon, derived from the Latin cancer = crab), the follower accompanies the leader backward (in retrograde). Alternative names for this type are canon per recte et retro or canon per rectus et inversus (Kennedy 1994). In a mensuration canon (also known as a prolation canon, or a proportional canon), the follower imitates the leader by some rhythmic proportion. The follower may double the rhythmic values of the leader (augmentation or sloth canon) or it may cut the rhythmic proportions in half (diminution canon). Phasing involves the application of modulating rhythmic proportions according to a sliding scale. The cancrizans, and often the mensuration canon, take exception to the rule that the follower must start later than the leader; that is, in a typical canon, a follower cannot come before the leader (for then the labels 'leader' and 'follower' should be reversed) or at the same time as the leader (for then two lines together would constantly be in unison, or parallel thirds, etc., and there would be no counterpoint), whereas in a crab canon or mensuration canon the two lines can start at the same time and still respect good counterpoint. The most familiar of the canons is the perpetual/infinite canon (in Latin: canon perpetuus) or round. As each voice of the canon arrives at its end it can begin again, in a perpetuum mobile fashion; e.g., "Three Blind Mice". Such a canon is also called a round or, in medieval Latin terminology, a rota. 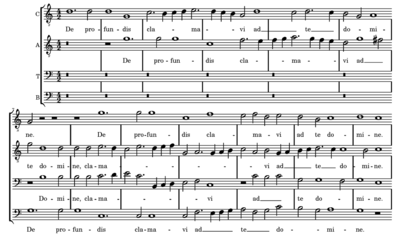 Sumer is icumen in is one example of a piece designated rota. Additional types include the spiral canon, accompanied canon, and double or triple canon. 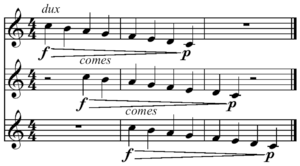 A double canon is a canon with two simultaneous themes, a triple canon has three. In a mirror canon (or canon by contrary motion), the subsequent voice imitates the initial voice in inversion. They are not very common, though examples of mirror canons can be found in the works of Bach, Mozart (e.g., the trio from Serenade for Wind Octet in C, K. 388), Webern, and other composers. A Table canon is a retrograde and inverse canon meant to be placed on a table in between two musicians, who both read the same line of music in opposite directions. As both parts are included in each single line, a second line is not needed. Bach wrote a few table canons (Benjamin 2003, 120). Olivier Messiaen employed a technique which he called "rhythmic canon", a polyphony of independent strands in which the pitch material differs. An example is found in the piano part of the first of the Trois petites liturgies de la présence divine, where the left hand (doubled by strings and maracas), and the right hand (doubled by vibraphone) play the same rhythmic sequence in a 3:2 ratio, but the right hand adapts a sequence of 13 chords in the sixth mode (B-C-D-E-F-F-G-A-B) onto the 18 duration values, while the left hand twice states nine chords in the third mode (Griffiths 2001). Peter Maxwell Davies was another post-tonal composer who favoured rhythmic canons, where the pitch materials are not obliged to correspond (Scholes, Nagley, and Whittall n.d.). A puzzle canon, riddle canon, or enigma canon is a canon in which only one voice is notated and the rules for determining the remaining parts and the time intervals of their entrances must be guessed (Merriam-Webster n.d.). "The enigmatical character of a [puzzle] canon does not consist of any special way of composing it, but only of the method of writing it down, of which a solution is required" (Richter 1888, 38). Clues hinting at the solution may be provided by the composer, in which case the term "riddle canon" can be used (Scholes, Nagley, and Whittall n.d.). J S Bach presented many of his canons in this form, for example in The Musical Offering. Mozart, after solving Father Martini's puzzles (Zaslaw and Cowdery 1990, 98), composed his own riddles using Latin epigrams such as "Sit trium series una" and "Ter ternis canite vocibus" ("Let there be one series of three parts" and "sing three times with three voices") (Karhausen 2011, 151). Other notable contributors to the genre include Ciconia, Ockeghem, Byrd, Beethoven, Brumel; Busnois, Haydn, Josquin des Prez, Mendelssohn, Pierre de la Rue, Brahms, Schoenberg, Nono and Maxwell Davies (Carvalho 1999, 38–39; Davidian 2015, 136; Davies 1971; Davies 1972; Hartmann 1989, passim; Hewett 1957, passim; Johnson 1994, 162–63; Jones 2009, 152; Leven 1948, 361; Litterick 2000, 388; Mann, Wilson, and Urquhart n.d.; Morley 1597, 173, 176; Perkins 2001; Tatlow 1991, 15, 126; Todd 2003, 165; van Rij 2006, 215; Watkins 1986, 239). According to Oliver B. Ellsworth, the earliest known enigma canon appears to be an anonymous ballade, En la maison Dedalus, found at the end of a collection of five theory treatises from the third quarter of the fourteenth century collected in the Berkeley Manuscript (Ciconia 1993, 411n12). Thomas Morley complained that sometimes a solution, "which being founde (it might bee) was scant worth the hearing" (Morley 1597, 104, cited, inter al., by Barrett 2014, 123). J. G. Albrechtsberger admits that, "when we have traced the secret, we have gained but little; as the proverb says, 'Parturiunt montes, etc.'" but adds that, "these speculative passages...serve to sharpen acumen" (Albrechtsberger 1855, 234). Josquin des Prez, Missa L'homme armé super voces musicales, Agnus Dei 2: One voice with the words 'ex una voce tres' (three voice parts out of one), a mensuration canon in three voices. Josquin des Prez, Missa L'homme armé sexti toni, Agnus Dei 2: two simultaneous canons in the four upper voices, and at the same time a crab canon in the two lower voices. Johann Sebastian Bach's Goldberg Variations contains nine canons of increasing interval size, ranging from unison to ninth. Each canon additionally obeys the overall structure and harmonic sequence common to all variations in the composition. In his early work, such as Piano Phase (1967) and Clapping Music (1972), Steve Reich used a process he calls phasing which is a "continually adjusting" canon with variable distance between the voices, in which melodic and harmonic elements are not important, but rely simply on the time intervals of imitation (Mann, Wilson, and Urquhart n.d.). Albrechtsberger, Johann Georg. 1855. J.G. Albrechtsberger's Collected Writings on Thorough-bass, Harmony, and Composition, for Self Instruction, edited by Sabilla Novello, translated by Ignaz von Seyfried, revised by Vincent Novello. London: Novello, Ewer, & Company. [ISBN unspecified]. Barrett, Margaret S. (ed.). 2014. Collaborative Creative Thought and Practice in Music. Farnham: Ashgate Publishing, Ltd. ISBN 9781472415868. Bridge, J. Frederick. . Double Counterpoint and Canon. London: Novello & Co., Ltd.; New York: The H. W. Gray Co., Inc.
Carvalho, Mário Vieira de. 1999. "Towards Dialectic Listening: Quotation and Montage in the Work of Luigi Nono". Contemporary Music Review 18, no 2: 37–85. Ciconia, Johannes. 1993. Nova musica and De Proportionibus, edited and translated by Oliver B. Ellsworth. Greek and Latin Music Theory 9. Lincoln: University of Nebraska Press. ISBN 9780803214651. Cook, Nicolas. 1990. Music, Imagination and Culture. Oxford: Clarendon Press; New York: Oxford University Press. Cooper, Martin. 1970. Beethoven: The Last Decade. London and New York: Oxford University Press. Davidian, Teresa. 2015. Tonal Counterpoint for the 21st-Century Musician: An Introduction. Lanham and London: Rowman and Littlefield. ISBN 978-1-4422-3458-1 (cloth); ISBN 978-1-4422-3459-8 (pbk); ISBN 978-1-4422-3460-4 (ebook). Davies, Peter Maxwell. 1971. "Canon: In Mem. IS". Tempo 97 (June): [Supplement]: In Memoriam: Igor Fedorovich Stravinsky. Canons and Epitaphs, Set I: one unnumbered page. Davies, Peter Maxwell. 1972. [Supplement]: "Canons and Epitaphs in Memoriam Igor Stravinsky. A Solution by Peter Maxwell Davies of the Puzzle-Canon He Contributed to Set I, Published in Tempo 97". Tempo, no. 100: three unnumbered pages. Griffiths, Paul. 2001. "Messiaen, Olivier (Eugène Prosper Charles)". The New Grove Dictionary of Music and Musicians, second edition, edited by Stanley Sadie and John Tyrrell. London: Macmillan Publishers. Hartmann, Günter. 1989. "Ein Albumblatt für Eliza Wesley: Fragen zu Mendelssohns Englandauenthalt 1837 und eine spekulative Antwort". Neue Zeitschrift für Musik 150, no. 1:10–14. Hewett, Helen. 1957. "The Two Puzzle Canons in Busnois's Maintes femmes". Journal of the American Musicological Society 10, no. 2 (Summer): 104–10. Johnson, Stephen. 1994. Beethoven. New York: Simon and Schuster. ISBN 9780671887896. Jones, David Wyn. 2009. The Life of Haydn. Cambridge and New York: Cambridge University Press. ISBN 978-0-521-89574-3 (cloth); ISBN 978-1-107-61081-1 (pbk). Karhausen, Lucien. 2011. The Bleeding of Mozart. Xlibris. ISBN 9781456850760. Kennedy, Michael (ed.). 1994. "Canon". The Oxford Dictionary of Music, associate editor, Joyce Bourne. Oxford and New York: Oxford University Press. ISBN 0-19-869162-9. Leven, Louise W. 1948. "An Unpublished Mendelssohn Manuscript". The Musical Times 89, no. 1270 (December): 361–63. Litterick, Louise. 2000. "Chansons for Three and Four Voices". In The Josquin Companion, edited by Richard Sherr, 335–92. Oxford and New York: Oxford University Press. ISBN 0-19-816335-5. Mellers, Wilfred. 1983. Beethoven and the Voice of God. London: Faber and Faber. Merriam-Webster. n.d. "Puzzle Canon"". Merriam-Webster Dictionary online edition (subscription required). Mortensen, Jørgen. n.d. "The 'Open Hierarchies' of the Infinity Series". In Per Nørgård: En introduktion til komponisten og hans musik (Danish and English), edited by Jørgen Mortensen. www.pernoergaard.dk (Accessed 20 January 2013). Musgrave, Michael. 1985. The Music of Brahms. London: Routledge. Perkins, Leeman L. 2001. "Ockeghem [Okeghem, Hocquegam, Okegus etc. ], Jean de [Johannes, Jehan]". The New Grove Dictionary of Music and Musicians, second edition, edited by Stanley Sadie and John Tyrrell. London: Macmillan Publishers. Richter, Ernst Friedrich. 1888. A Treatise on Canon and Fugue: Including the Study of Imitation. Boston: Oliver Ditson. Translated from third German edition by Foote, Arthur W. [ISBN unspecified]. Sanders, Ernest H. 2001a. "Rota". The New Grove Dictionary of Music and Musicians, second edition, edited by Stanley Sadie and John Tyrrell. London: Macmillan Publishers. Sanders, Ernest H. 2001b. "Sumer is icumen in". The New Grove Dictionary of Music and Musicians, second edition, edited by Stanley Sadie and John Tyrrell. London: Macmillan Publishers. Scholes, Percy, Judith Nagley, and Arnold Whittall. "Canon". The Oxford Companion to Music, edited by Alison Latham. Oxford Music Online. Oxford University Press (accessed 13 December 2014) (subscription required). Tatlow, Ruth. 1991. Bach and the Riddle of the Number Alphabet. Cambridge and New York: Cambridge University Press. ISBN 978-0-521-36191-0. Todd, R. Larry. 2003. Mendelssohn. Oxford and New York: Oxford University Press. ISBN 978-0-19-511043-2.
van Rij, Inge. 2006. Brahms's Song Collections. Cambridge and New York: Cambridge University Press. ISBN 978-0-521-83558-9. Walker, Paul Mark. 2000. Theories of Fugue from the Age of Josquin to the Age of Bach. Rochester, NY: University of Rochester Press. ISBN 9781580461504. Watkins, Glenn. 1986. "Canon and Stravinsky’s Late Style". In Confronting Stravinsky: Man, Musician, and Modernist, edited by Jann Pasler, 217–46. Berkeley and Los Angeles: University of California Press. ISBN 0-520-05403-2. Zaslaw, Neal, and William Cowdery (eds.) 1990. The Compleat Mozart: A Guide to the Musical Works of Wolfgang Amadeus Mozart. New York: W. W. Norton & Company. ISBN 9780393028867. Agon, Carlos, and Moreno Andreatta. 2011. "Modeling and Implementing Tiling Rhythmic Canons in the OpenMusic Visual Programming Language". Perspectives of New Music 49, no. 2 (Summer): 66–91. Amiot, Emmanuel. "Structures, Algorithms, and Algebraic Tools for Rhythmic Canons". Perspectives of New Music 49, no. 2 (Summer): 93–142. Andreatta, Moreno. 2011. "Constructing and Formalizing Tiling Rhythmic Canons: A Historical Survey of a 'Mathematical' Problem". Perspectives of New Music 49, no. 2 (Summer): 33–64. Blackburn, Bonnie J. 2012. "The Corruption of One Is the Generation of the Other: Interpreting Canonic Riddles". Journal of the Alamire Foundation 4, no. 2 (October):182–203. Davalan, Jean-Paul. 2011. "Perfect Rhythmic Tiling". Perspectives of New Music 49, no. 2 (Summer): 144–97. Johnson, Tom. 2011. "Tiling in My Music". Perspectives of New Music 49, no. 2 (Summer): 9–21. Lamla, Michael. 2003 Kanonkünste im barocken Italien, insbesondere in Rom. 3 vols. Berlin: Dissertation.de—Verlag im Internet. ISBN 3-89825-556-5. Lévy, Fabien. 2011. "Three Uses of Vuza Canons". Perspectives of New Music 49, no. 2 (Summer): 23–31. Messiaen, Olivier. Traité de rythme, de couleur, et d'ornithologie (1949–1992). I-II, edited by Yvonne Loriod, preface by Pierre Boulez. Paris: Leduc, 1994. Schiltz, Katelijne, and Bonnie J. Blackburne (eds.). 2007. Canons and Canonic Techniques, 14th–16th Centuries: Theory, Practice, and Reception History. Proceedings of the International Conference Leuven, 4–5 October 2005. Analysis in Context: Leuven Studies in Musicology 1. Leuven and Dudley, Massachusetts: Peeters. ISBN 978-90-429-1681-4. Vuza, Dan Tudor. 1991–93. "Supplementary Sets and Regular Complementary Unending Canons", in four parts. Perspectives of New Music 29, no. 2 (Summer 1991): 22–49; 30, no. 1 (Winter): 184–207; 30, no. 2 (Summer, 1992): 102–25; 31, no. 1 (Winter 1993): 270–305. Ziehn, Bernhard. Canonic Studies: A New Technique in Composition, edited and introduced by Ronald Stevenson. New York: Crescendo Pub., 1977. ISBN 0-87597-106-7. Animated graphical scores of canons by Pachelbel, Bach, et al.